A month ago, I didn’t even know what to call you. I tried out Kevin & Judy, but it felt lazy to use the names of the two main characters. Matters in the End was also in the running, because those words are in the book and I like it when a novel’s title is derived from the text inside, except this one sounded grandiose for no good reason. Since tennis plays a part in your story, I ran through the usual suspects: Break Point. Match Point. First Serve. The Advantage. None was right. But then I thought of love, which is where everything begins in tennis, a score of love-love, except that made the book too tennis-centric. So I dropped the bridge in between, and there it was, Love Love, first word verb, second word noun. Because my characters need to love their love. We all do, don’t we? No. That’s quite enough. Time to can it and come clean. I owe you that much. Everything I’ve said so far has been a delaying tactic in what I really need to say. I’m sorry I maligned you every chance I got. Still do, in fact. It’s the first draft, I tell people. It’s horrible. I’m ashamed of it. You’re not surprised, I know. After all, you were the one who saw my grimace each day, set against the blank whiteness of the virtual paper on the monitor, the cursor whose constant blinking was a neverending accusation of my ineptitude. There were days when I hated every word of you. Especially Chapter 22. Remember? We thought it would never end. Why can’t I just shut up? You heard me saying that, didn’t you? But we did end that chapter. And there were others after that one, and then came the epilogue and we were done, you and I. Maybe it wasn’t so bad. It was a team effort, and I appreciate you hanging in there. Please, stop staring at me like that. I’m not asking for forgiveness. I just want you to understand, that’s all. This was hard. We both took a beating. I know you think I should’ve handled myself better, since I’ve had some practice. But your brother Everything Asian was completely different from you. He was my first, and I really didn’t know what I was doing, and things just sort of fell into place. Or at least that’s what I think now. See, the problem is that I don’t write books that often, and the bad experiences tend to fade away with time. It’s sort of like raising a puppy – people forget how difficult it was a dozen years later, and there they are again, adopting another cute canine tyke, unaware the cycle is about to begin anew. With you, I was supposed to know better, so this should’ve been a smoother ride, but it wasn’t. 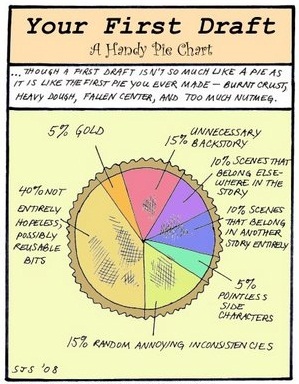 It’s funny, really, what we expect from writers, and people in general. Just because a guy writes one book, why does that automatically make it possible for him to write another, and not only that, but better, since he is no longer an amateur? They say practice makes perfect, but I say they’re wrong. Think of the number of athletes who star in their rookie year and fade out. Or musicians who produce that first brilliant album and pump out schlock for the next twenty years. It happens all the time. I hope you are richer and more complex than your older brother, but that’s all it is, hope. I’m sorry I’ve failed you, Love Love. I wish you were perfect, but you’re not. I wish everyone could see you as you are now, but only a handful will. Some parts of you will live on, but who you are right now, the complete being of a novel, with all your plot potholes and cheesy characters – that will die. A month from now, you will return from my readers with bloody red lines that slash you, cut you, carve out entire chunks of you. I know this is hard to hear, but I want this. I want the carnage because that’s the only way I’ll be able to make you better. There is a good book inside of you, but it’s not you. The worst thing of all is that I’ll be glad when you are gone. I’ll love what you will become, but I can’t love you now. Because, at the core, I despise you and all of your failures. If it’s any consolation – I know it isn’t – I’ll save your amputated parts. You won’t be alone – there’s a folder on my hard drive that’s full of snippets of unworkable material excised from previous works. It’s a graveyard of the broken and the ridiculous, and even though I take a gander every so often to see if there’s anything worth picking through, there isn’t. Like the extra feature on a DVD of a cut scene, there’s a reason why it’s cut. I am sorry, Love Love. I mean it. Thank you for giving it your all, even though we both know it wasn’t good enough. Well, for what it’s worth, I know I won’t be disappointed. Irene, you are entirely too sweet. Thank you. At this point in the rewrite, I can use all the positive energy I can get.